Like many other positive things, art can be therapeutic and have healing properties. Coming from Argentina, Elian Chali is a contemporary artist who, due to dyslexia, always had problems when it came to writing. However, all those problems seem to go away when he is holding a can of spray in his hands and painting on the walls around the world. Characterized by the close dialogue with the environment in which they are created, Elian’s works are composed through basic geometry and abstraction, and influenced by architecture, climate, and the current socio-political situations. His favorite theme is the city. Through his work, the artist seeks to open a discussion that goes from the social problems to the poetry of the habitat in which he creates. Always interested in the environment and the surroundings in which he paints, Elian has been particularly interested in perspective in 2016. For his piece in the historical neighborhood of Barracas, Buenos Aires, he highlighted the original structure of the building with the intention of proving that the city functions as a dynamic body and suffers the evolution of adaptations every day. 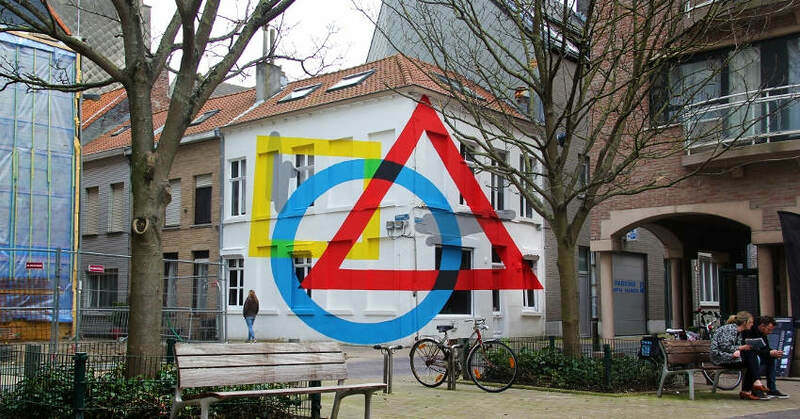 A piece created in Ostend, Belgium, titled Exercise Of Anamorphosis #2, is a continuation of his explorations of perspective. This time, he painted on a two-sided building, located on the corner and in front of the playground and a square. Based on generating the effect of image construction by finding the exact point of view from which the piece should be observed, this has been the second time that Elian exercised the technique of anamorphosis. As always, the composition is made of primary colors and geometric elements. What’s interesting about this piece and the applied technique is that with each new angle of observation comes the natural deformation of both perspective and methodology of the site. Always working with a sketch in hand, Elian’s art has evolved from 3D graffiti to flat images. He studied graphic design but doesn’t have a particular affection towards “institutions”. When he started painting in the streets, he was fifteen and drawn to the field by many of his friends that were also working on the streets. As mentioned above, being dyslexic always meant having troubles with writing – with spray cans, he finally found the way to truly express himself without any problems. Everyone in his family was supportive of his decision to make art, and his mother even bought his first can of spray. His aesthetics are inspired by the Pop-Art, minimalism, Russian constructivism, and neoplasticism. Speaking of artists that are inspirational to him, El Tono, Jaz, and Momo stand out among those who paint in the public spaces. On the other side, he also enjoys the work of Pablo Siquier, Piet Mondrian and Sol LeWitt. In May 2016, Elian published Hábitat, a conceptual book where he discusses the city as socio-cultural phenomenon, pretending to understand the environment in which the humans live. Aside from Prologue written by the renowned american photographer and anthropologist Martha Cooper, this masterpiece also contains 143 images taken around the world and 3 essays. He is represented by Adda Gallery. 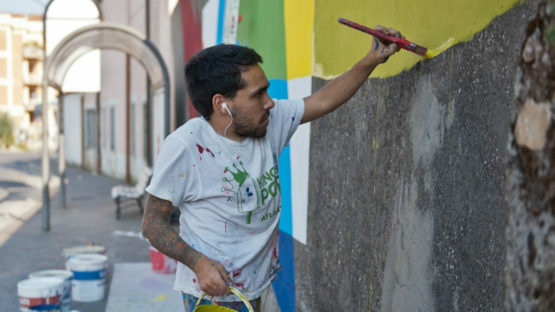 Elian lives and works in Córdoba, Argentina.